This year’s Arrowverse crossover begins with a double whammy taking place in episodes of Supergirl and Arrow. Our heroes are forced to battle the darkest parts of themselves when Nazis from another Earth attack. A crossover like this creates problems for a reviewer in terms of how to approach it. I wrestled with whether I would cover each episode individually, do it day by day or just wait until the event is over and cover it as a whole. Ultimately I decided to break it down by night so this review will cover the Supergirl and Arrow episodes and talk about them as a whole. Effectively these two episodes make up part 1 of “Crisis on Earth-X” so it seemed like the most logical approach. When it comes to my rating I’ll give each episode an individual score creating an average for the two episodes. 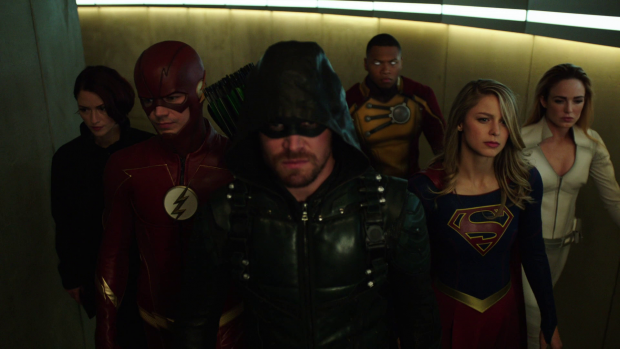 Previous Arrowverse crossovers have been faced with the problem of how to approach them. The first attempt had largely unconnected episodes where the characters from the other shows served as guest stars, the second crossover was more connected but still felt like episodes of individual TV shows. Last year’s “Invasion” was a strange and often awkward hybrid of individual episodes and a single story. This year the approach is completely different and fully commits to the idea of this being an event spread across four episodes of four TV shows. The story is front and centre with each of the characters being part of that story. For me this is what I wanted from the crossovers all along and I’m pleased to finally get that. Of course there is a counter argument; for those who only watch one of the shows there might not be an awful lot in it for them. For example the Supergirl episode doesn’t have a lot of those characters in it which might be disappointing for those who only want to see what Kara Danvers is up to this week. It seems that a risk based approach has been taken to this particular crossover with the assumption that viewers will be willing to just go with it and watch the crossover in its entirety because it features the characters that then enjoy. I suppose the ratings will be telling. For me personally it isn’t a problem as I watch all of the Arrowverse shows so there’s a lot in here for me as a fan. Just seeing all of the characters coming together and interacting is a lot of fun for me and the episode certainly delivers on that score. The first part is almost entirely focused on the Barry/Iris wedding as we are taken through the lead up to the rehearsal dinner right up to the botched wedding. It sets up the premise really well with a brief scene on Earth-X showing Nazi Oliver fighting the Earth-X version of James Olsen to show how brutal that world is before introducing each of the main characters from the various shows. Barry is shown to be fighting King Shark, Oliver is taking on a group of random ninjas, Kara is fighting a Dominator and some of the Legends are in Merry Old England. The connection comes from a discussion over whether to attend the wedding reminding the audience that these characters do have a reason to come together despite the fact that they are all doing very different things. It’s a really slick way of dealing with the problem of finding an excuse to bring them together. Instead of manufacturing some kind of large scale problem that inspires a team-up –though that comes later- they come together to celebrate the wedding of a friend. Friendship and shared history is responsible for getting everyone in the same room. It’s refreshing to have a low key and character driven reason for these characters to spend time together. I also applaud the first part for taking the time to let the characters bounce off each other without creating life threatening tension right away. They aren’t attacked until the very end of the episode which means that there’s plenty of time to let these character dynamics shine. It very saccharine in the way it’s portrayed a lot of the time such as Barry encouraging Oliver to marry Felicity and the general romance of the Barry/Iris wedding narrative that will either delight or irritate depending on how invested you are in this story. Speaking as someone not that invested in their relationship I wasn’t especially moved by most of it but it didn’t quite reach the realm of the infuriating. This is likely due to the presence of the other characters who help to distract from the fairy-tale wedding aspect. Barry and Iris may come across as the perfect couple to those around them but other characters are dealing with their own issues. Kara is still reeling from finding out that Mon’El is married to another woman and Alex is still struggling after her break-up with Maggie. They each deal with it in their own way with Kara seeing this as an opportunity to get away from it all and Alex hooking up with Sara after a lot to drink. Sara and Alex’s hook up could be seen coming a mile off since they are the two openly gay -or bisexual in Sara’s case- characters in the Arrowverse which might seem a little insensitive with them being immediately paired off but it worked as character development for Alex. She says on more than one occasion that she has never had a one night stand and doesn’t feel good about the fact that she slept with a strange woman hours after meeting her. Kara is there to offer advice and tells her that she has done nothing wrong and it’s very healthy to have fun at a wedding. Alex torturing herself turns out to be a symptom of a deeper seated issue involving regretting breaking off her engagement with Maggie. She opens up to Kara about feeling that she made a mistake and might be reconsidering but Kara reminds her that she was right to do so considering they wanted different things. It’s a solid balance between the more comedic aspect of Alex being awkward around Sara and the fact that she is dealing with the end of a profound emotional connection. Sara is fairly nonchalant about the encounter as expected. She isn’t shy about admitting it happened but also doesn’t want to make a big deal of it. Alex”s reaction is clearly something she understands so she doesn’t make a big deal out of it. I suspect there will be a heart to heart of some kind before the crossover ends but for now it’s a good excuse for Alex to confront her feelings and is an example of taking advantage of the potential provided by bringing the different shows together. 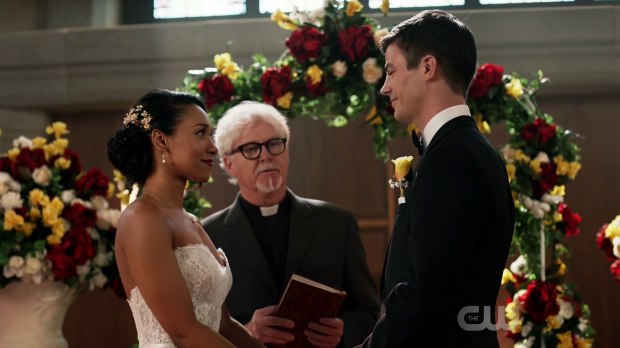 There were some well written emotional moments throughout the first part such as Joe’s speech about finding love and how proud he is of Barry and Iris. Kara singing a rendition of Barry’s proposal song from last season’s musical crossover was a nice moment as well and it’s always great to hear Melissa Benoist sing. One scene in the first part involving a very enthusiastic waitress (Jessica Parker Kennedy) very excited to be at this particular wedding came across as clumsy. It’s clearly foreshadowing something but doesn’t do so very well. My working theory is that she’s Barry and Iris’ future daughter come back in time to witness the wedding of her parents. I suspect the question will be answered fairly soon. The most impressive moment of the first part was the attack on the church. Every member of the cast -including Wally- had something to do and the whole thing played out in a really coherent way despite the sheer number of moving parts. 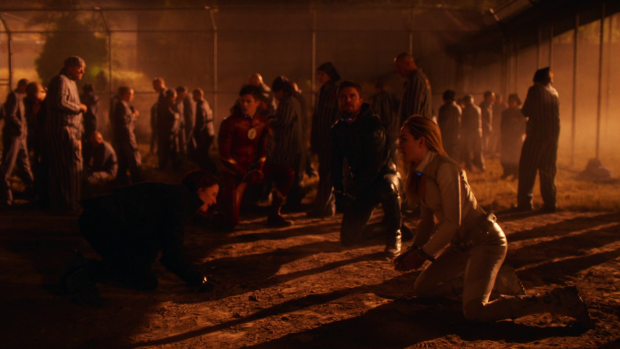 Barry catching multiple bullets as Cisco and Caitlin used their powers to knock Nazi’s over made for some excellent visuals and hand to hand combat was well represented thanks to Alex, Sara and Oliver. I also enjoyed seeing Kara take on her evil counterpart which varied the setting somewhat. It’s notable that this fight ends with something of a victory for the heroes as their Nazi opponents are forced to temporarily retreat. Up until now I’ve largely discussed the first part because it was important to talk about how the foundations were laid for the rest of the story. There are plot points that play out across both parts that are best talked about in terms of how they have been handled so far. The most interesting was the furthering of Martin and Jax attempting to separate themselves in a way that won’t prove damaging so that Martin can be with his family and spend time with his grandchild while Jax continues on with the Legends. As predicted; Harry and Cisco wast no time coming up with that miracle cure. It’s another example of this crossover being something that fans of each show are simply expected to run with but more than that it presents a solution for Martin and Jax as well as a difficult choice. They can have what Martin wants but the downside is that Firestorm will no longer exist though that isn’t even the worst of it. Jax is upset about the fact that he will lose Martin because he’s the closest thing to a father he will ever have. It’s a touching moment that feels earned considering how much these characters will go through. Whether the decision will be made by the end of the crossover or not remains to be seen but leaving it as a source of tension works well enough. One thing that doesn’t work quite so well is Oliver and Felicity’s back and forth over whether they should get married. Oliver proposes to her at the rehearsal dinner and is denied which results in a later conversation where they discuss the reasons for that. Felicity is against the idea of marriage for some reason and prefers just maintaining what they currently have. Oliver wants the commitment and to show that but Felicity doesn’t feel the same. It’s a conversation that fails to be interesting, goes nowhere and reeks of manufactured drama. Considering the relationship only recently reasserted itself it really didn’t take long for unnecessary angst to appear. Scenes like this are indicative of a problem that the second episode has. There’s a long stretch of scenes where various pairings get together to discuss their feelings. It feels out of place, inorganic and derails the pacing somewhat since full focus should be on the looming Nazi threat rather than petty emotional issues that are overshadowed by the larger threat. The exception to this is Jax and Martin who have to work through their tension lest they be less effective in the field because of their symbiotic connection. There were a lot of other fun elements such as Mick in general. Sitting next to Captain Singh at the wedding was comedy gold thanks to the shared reaction and the fascination he developed for Caitlin once he learned about her frosty alter ego was constantly entertaining. Her reaction to it was note perfect and the two actors bounced off each other really well. When the focus does returns to the overall story the episode is great. Evil Oliver and Evil Kara are really interesting characters even if they are very thinly drawn. Both actors clearly have a great time portraying the over the top and evil versions of their usual characters. Melissa Benoist’s performance was particularly noteworthy especially in the scenes where she mocks her other self. They are noticeably over the top which works for Nazi versions of characters we know so well and keeps the fun factor throughout while still allowing them to be taken seriously enough represent a threat. The closest analogue is the mirror universe counterparts from the classic Star Trek: The Original Series episode “Mirror Mirror” though the characters here aren’t quite as over the top. The other villain introduced is our old favourite Eobard Thawne played by Tom Cavanagh because Thawne decided to wear that face for no reason other than people love Cavanagh in that role. This version of Reverse Flash is the one we know from The Flash and DC’s Legends of Tomorrow and it’s implied that he is the one who caused Earth-X to be overrun by Nazis. Using the familiar Thawne is a good idea as it adds weight to the villain story by connecting it to our heroes. Barry in particular has a personal stake in it thanks to his history with Thawne and the Legends also have previous since he was one of their primary villains last season. Thawne being the villain allows the reason that Earth-1 and specifically the Barry/Iris wedding are a target to be clearly explained away as being engineered by Thawne out of spite more than anything else. The best way to describe him is that he’s deliciously evil. Their presence makes for some great action sequences as well. In particular the warehouse sequence was brilliantly handled even if Barry and Thawne’s contribution was relegated to a coloured blur streaking across the screen. Despite that the action was wonderfully kinetic and made for great viewing. The blur representing Barry and Thawne reminds us of how fast paced the sequence is and how many individual battles are happening within that. 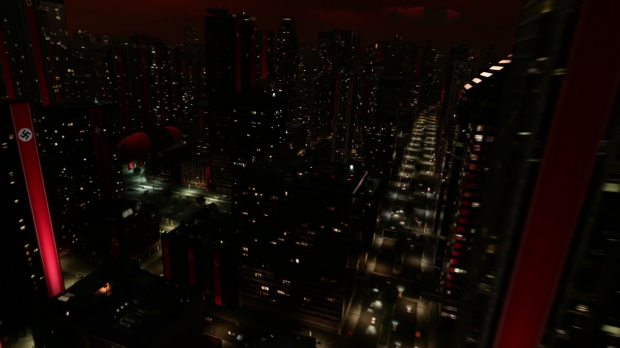 Evil Oliver’s attack on S.T.A.R. Labs was similarly well executed with an epic entrance from Team Arrow and a good use of Mick and Caitlin who make for an excellent team. Evil Oliver making quick work of everyone against him reminds us what would happen if Oliver didn’t use his skills to protect people. The overall villain plan has yet to be clarified which is fine for the halfway point in the story. For now it has been established that evil Kara is dying and needs a heart from a compatible donor. The Nazi’s steal a prism that can be used to replicate the red son conditions of Krypton so that Kara can be operated on. I like this motivation a lot because it’s very character driven and allows the relationship between Evil Oliver and Evil Kara to have some development. We don’t see much of them together and the novelty does wear off a little after the initial shock value though it is strongly played. It’s believable that Evil Oliver would use all the resources at his disposal to save his wife because we know that our Oliver would do the same for people he cares about. Every difference brings with it a similarity which makes the counterparts feel like more than evil copies. I suspect there’s a bigger plan afoot because the desire to perform heat surgery on Kara isn’t quite enough to sustain a four episode crossover. There are reference to the Führer who will almost certainly be someone familiar to viewers. 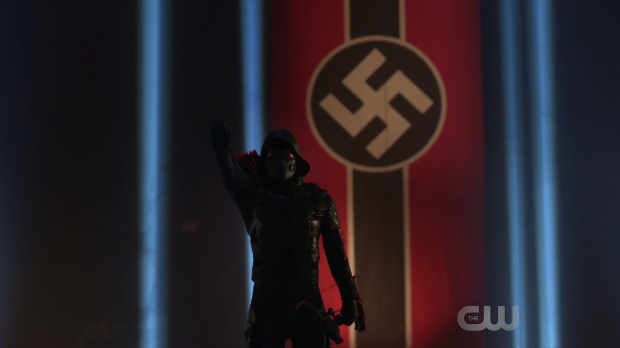 My bets are on the Führer turning out to be Barry’s Earth-X counterpart though I would love it if it were Tyler Hoechlin’s Evil Superman. It would be a fun twist and would fit with Harry’s explanation that there are 53 versions of everything including Krypton. This also makes me wonder what happened to the Krypton native to Earth-1’s universe but that’s for another time. The cliffhanger showing the most powerful characters imprisoned on Earth-X while everyone else is under Nazi control in S.T.A.R. Labs was effective as it puts the story at its darkest point which is perfect as far as structure goes for a story like this. I look forward to seeing how the heroes will build themselves back up. An excellent pairing of episodes to begin the crossover with the first part being stronger than the second. The first episode really benefited from allowing time for the characters to interact without impending death hanging over their heads. Thanks to this the setup didn’t feel rushed and leaving the villain attack until the very end was a good idea. Mileage on the execution will vary depending on how invested you are in the Barry/Iris relationship or if you watch all of the shows but I found that there was a good mix of saccharine romance and other content to keep things from becoming stale. The second part suffers from structural problems in a pace destroying midsection where the characters all stop to discuss their feelings in conversations that often came across as tedious especially in the case of Oliver and Felicity. Once the story returns to the more important plotting things pick up significantly but these scenes do drag the episode down somewhat. 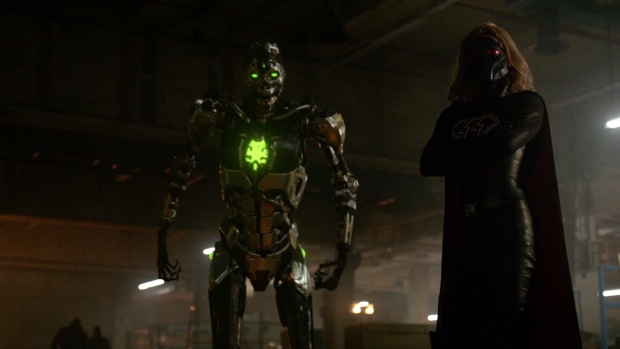 The villains are exactly what the crossover needs and are really well played by Stephen Amell and Melissa Benoist who bring enough evil to their performances while still bringing across that there are similarities albeit deeply buried. It’s a good mix and the character driven motivation to save Evil Kara’s life works for now. The episode ends on an perfect cliffhanger putting the story at its darkest point for the heroes.